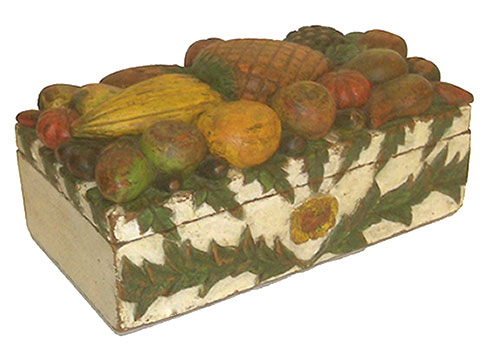 Incredible Folk Art Box Covered with an assortment of fruit that looks good enough to eat! It is truly the work of very talented and imaginative artist and is signed on the back I. DADE, Oct.25, 1871. Among the many pieces of fruit represented are crab apples, strawberries, grapes, pears, and plums, etc. and on the very top is a wonderful pineapple and a squash. All are very realistically carved and painted. There is some wear to the paint on some of the high spots as should be expected but the box is in overall untouched original condition with no repairs or inpaint. It is made of white pine and the fruit is all carved out of one piece of wood. 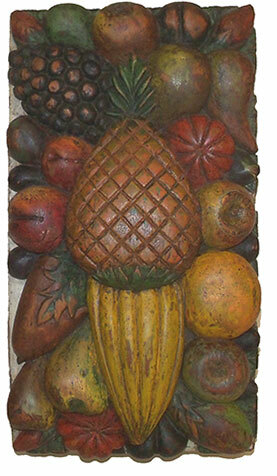 Length is 12 inches, depth is 6-1/2 inches and it is approximately 6 inches tall at the highest point on the pineapple. The box most likely was made as a gift to some lucky recipient.